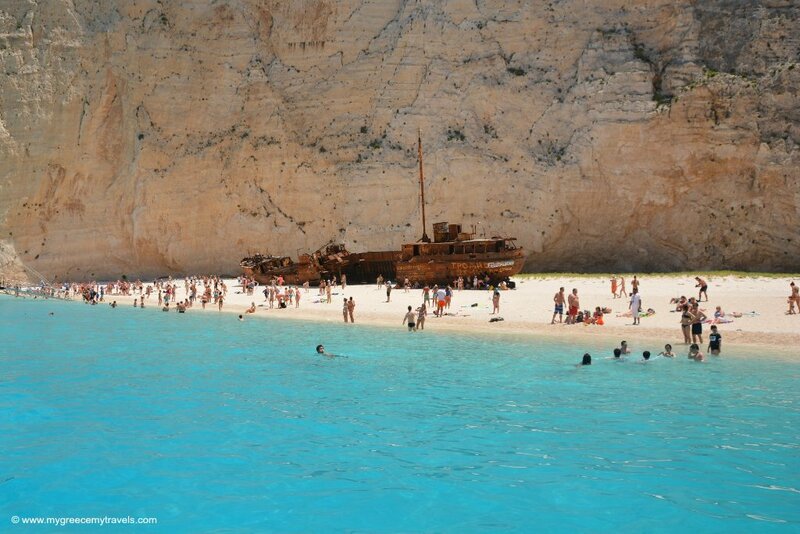 The Navagio Shipwreck Beach experience is a must when visiting Zakynthos. There’s a reason it is one of the most photographed beaches in the world. A blanket of bright, royal blue sea surrounded our little taxi boat. As if that royal blue wasn’t stunning enough, it morphed into a translucent turquoise as we approached the famous Shipwreck Beach, also known in Greek as Navagio. A rocky beach embraced this little beach cove, carved into a fantastic chunk of the Ionian island’s northwestern landscape. History of the Shipwreck: How Did That Get There? I learned it was the special spot where the Panagiotis ship crashed onto the shore while on its way to transport illegal cigarettes. Busted. That was 1983. 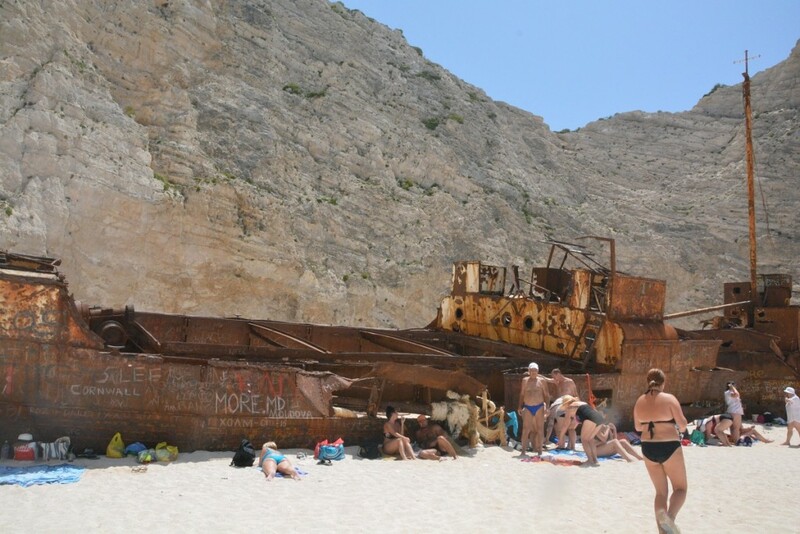 Since then, the beach and its wreck have remained a must-see attraction on the isle. 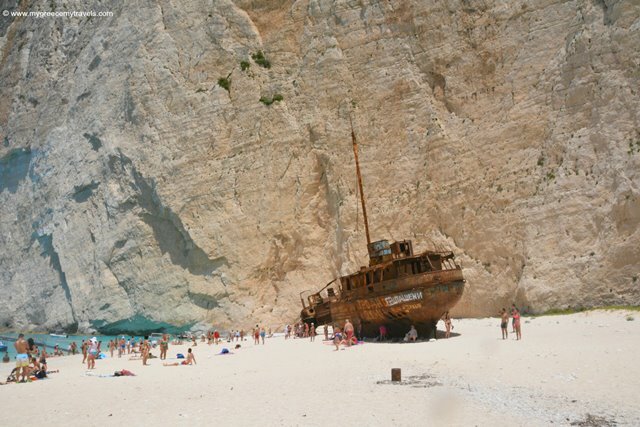 On shore, the gigantic rusty ship remains, kind of making a statement on the bright beach. There were just a dozen of us on the small boat. It was a smooth, relaxing 20-minute ride from Agios Nikolaos. Among all of the options to get to there, it was the way our local hosts preferred to take us. That was confirmed later as we relaxed on a shady corner observing double-decker boats pull up, packed with a hundred or more tourists. The crowd rushed off the planks, eager to get off after a one-hour ride from Zakynthos Town. My fellow Greece-based members from Travel Bloggers Greece and I spent every moment after that short shady rest taking pictures under the bright sun and enjoying the cold, crisp sea. The water got deep fast, so it wasn’t my favorite kind of swimming beach. Still, it was like being in a blue and white heaven. The ship itself was “open” to visitors to freely explore it. Some found refuge in the shade it provided on the tree less beach. Visitors clearly left their marks of graffiti in all sorts of languages over the years. We stayed about an hour until the water taxi boat came to bring us back to the port. 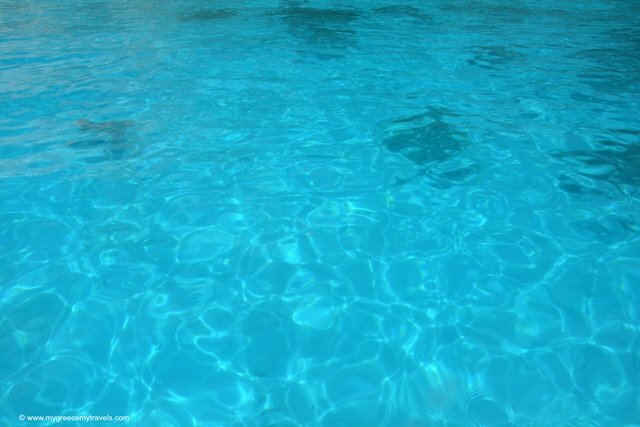 The driver stopped at this turquoise swimming spot before heading back. Conclusion? It was one of the most beautiful beaches I have ever explored. Here’s a new YouTube video right from the scene. 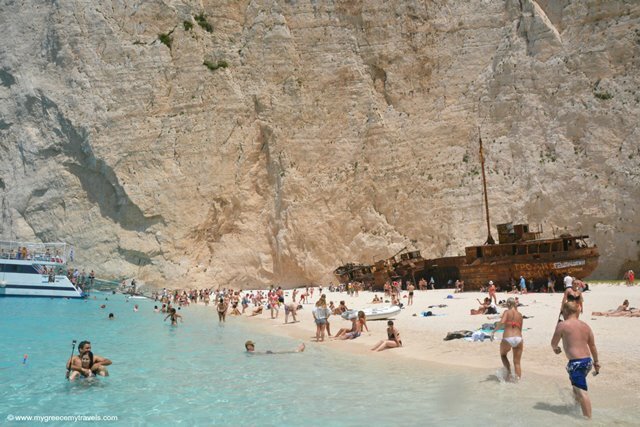 Check out this very informative site Zakynthos Insider to learn more insider tips about this amazing beach! Regular tours to the beach depart from Porto Vromi to the south. We took a boat from Agios Nikolaos in the northeast. Another option is Cape Skinari in the northeast. Those wishing to leave from Zakynthos Town may do so also but it will be a longer ride. Prices vary depending on the type of boat you ride. There’s a big variety and frequent departures during the summer months. There is a daily bus with services to the cities of Athens, Patras and Thessaloniki via a short journey on the Zakynthos-Kyllini ferry. Bus travel via the Athens – Kyllini line is about 4 hours and 30 minutes. From Kyllini there is direct ferry to Zakynthos. There is an airport on Zakynthos. Flights are 45 minutes. Between April and October there are direct charter connections with many European cities. The Zakynthos airport is in the town of Ampelokipi, which is three kilometers from Zakynthos Town. Check out the best flight deals on Vayama. To get around the island, you’ll save time if you rent a car. I can recommend booking through Avis Europe. Zakynthos is filled with all types of hotel options. I enjoyed my stay at the three-star Plessa Palace hotel in the quiet resort town of Alykanas. 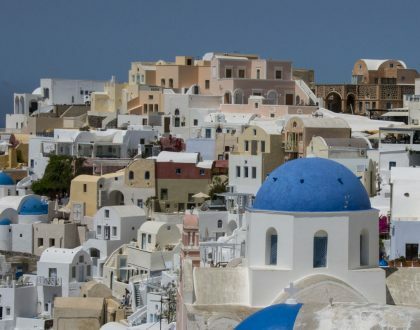 A very hospitable Greek family-run hotel with a good little Greek restaurant. 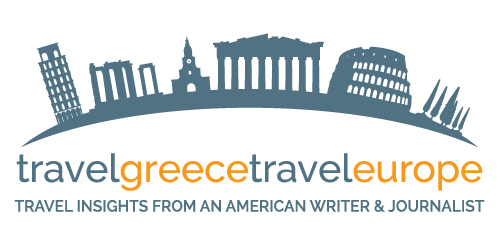 Check out my post: Where to Eat on Zakynthos. Go by private boat to visit the Keri Caves, Marathonisi Island and see the endangered sea turtles. 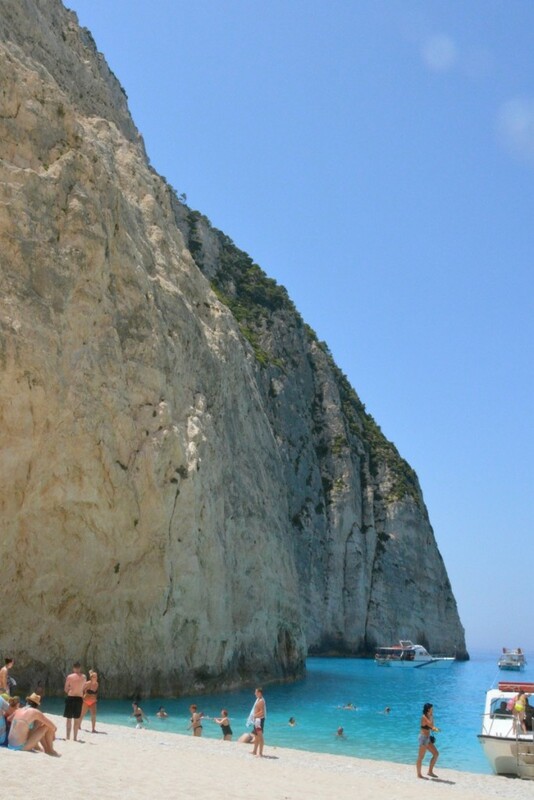 Details in my post Zakynthos Sea Caves, Sea Turtles and Dreamy Beaches. 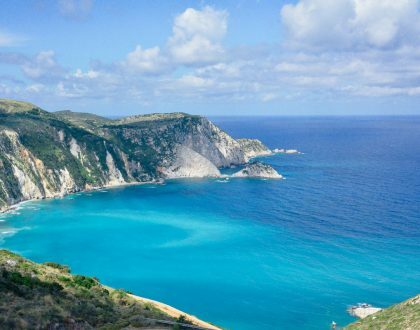 Also be sure to explore off-the-beaten-path Zakynthos. Find out some great local tips from my post. 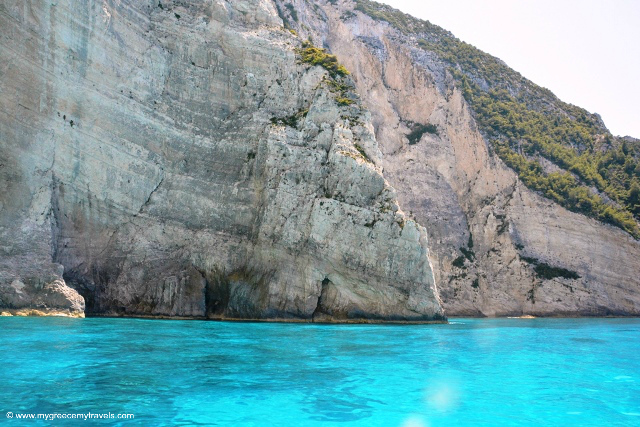 Visit the Blue Caves of Zakynthos, too! 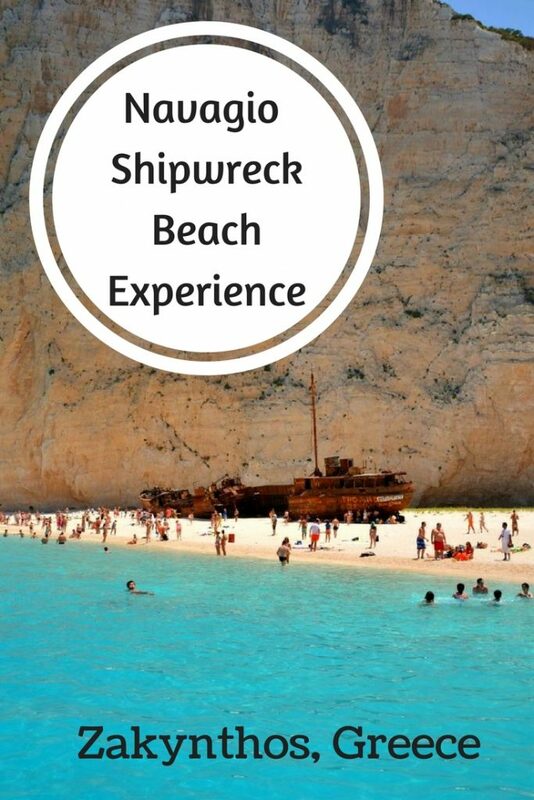 Have you ever been to the famous Navagio Shipwreck Beach in Zakynthos? This beach is a must see, Marissa! 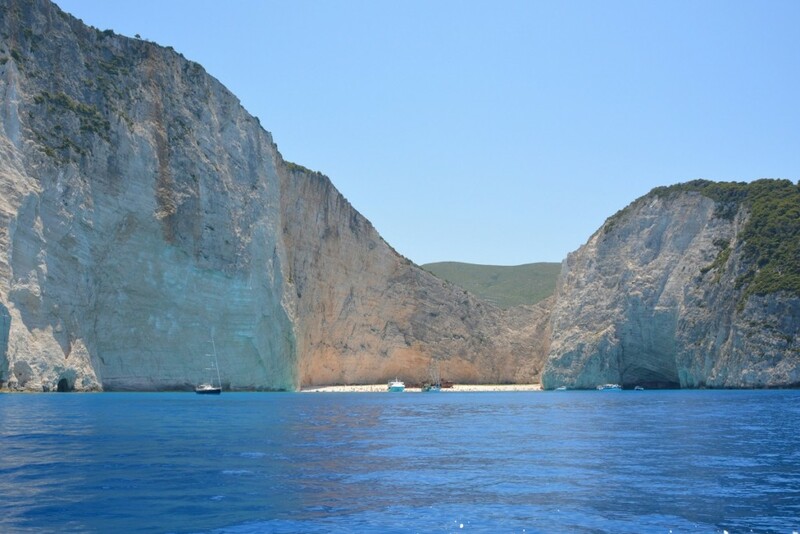 Fortunately, there are boats that often go to Navagio. I have read somewhere that the sand was brought there from China. Hey Agness, Yes, it really is. Taking the little boat over was great because we avoided the crowds. That’s a funny story about the sand. I don’t believe it. LOL. We toured with locals and the beach go bigger, naturally formed after the shipwreck creating the whole scene. The island is ringed with fantastic beaches with tons and tons of gorgeous sand. 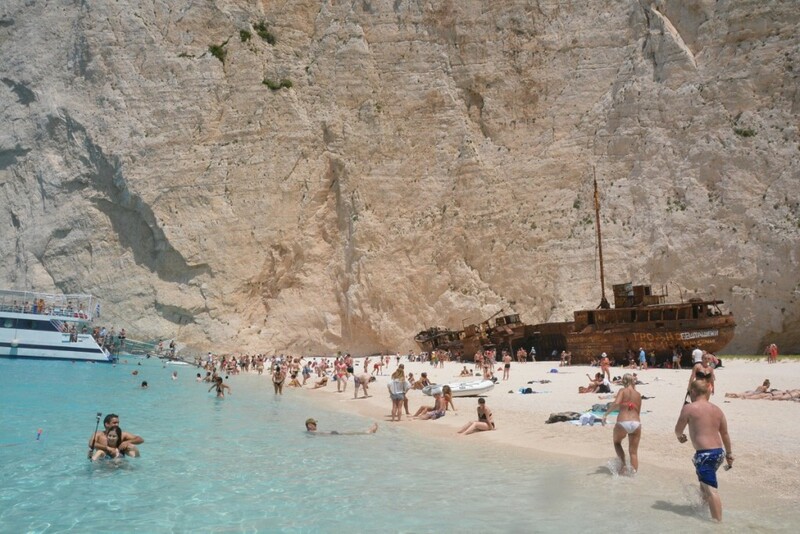 Navagio Shipwreck Beach is just the most popular because, well — it’s one of kind! Thanks for an informative post. 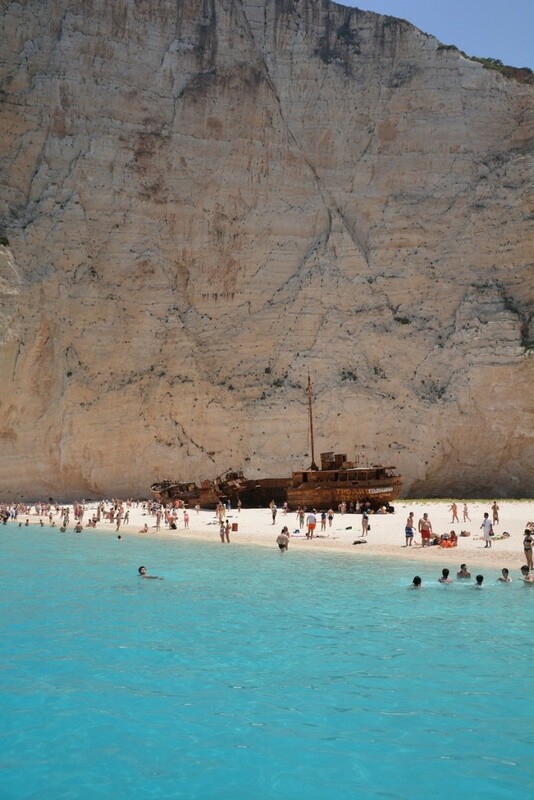 I am planning to do a day trip to Navagio beach from Athens with my husband. What would you recommend is the best way to go about it? Thanks in advance. We would love to go on a small boat as you did! Navagio is a bit far from Athens for a day trip. It will take almost a day to get to Zakynthos! For a weekend, that would be okay but I suggest a few days. If you will be based in Athens… These small boats are easy to hire so you won’t have an issue finding one once you are on the island.